We all are champions through intergenerational leadership! 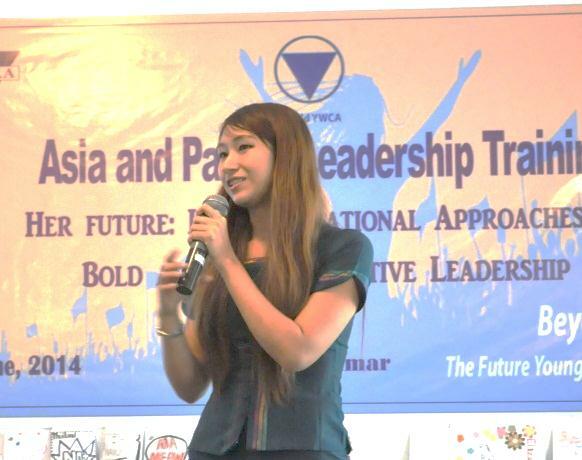 Asia and Pacific Leadership Training was held from 2nd-8th June, 2014 in Yangon Myanmar with the theme of “Intergenerational Approaches to Bold and Transformative Leadership”. There were 30 participants: presidents, general secretaries, mentors, young women and young women leaders from Bangladesh, Thailand, Sri-Lanka, India, Myanmar, Nepal and Solomon Island. The topics of the training are very interesting: personal leadership journey, monitoring and evaluation, advocacy, gender equality, sexual and reproductive health and rights and rights-based approach. Moreover, we learned about human rights, sexual and reproductive health and rights and sexually orientated Gender Identity through this amazing film called “Philomena”. In addition, together with the participants from Myanmar as Country team, we work together for the monitoring and evaluation for the young women’s leadership training institute project and we discussed about the advocacy action plan for the violence against women, young women and girls. Young Women’s Dialogue is one of the programmes where partner organisations of YWCA of Myanmar attended. The country representatives from Burnet Institute, Help Age International and Women’s Organisation recognise, realise and embrace the skills and abilities of young women. Furthermore, they acknowledge the importance of meaningful of young women as essential. After joining training, there are many questions in my head concerning my personal leadership journey, intergenerational approach, rights based approach, envisioning 2035 and advocacy etc. This training is totally a safe space for all to learn, share and express ourselves. As a young woman participant of this training, I feel the sense of intergenerational spirit. No matter what our positions at work, our age, our experiences, we work together as a team, we acknowledge each other, value each other, accept the diversity and find the solutions for the problems with the solidarity spirit.